It’s not often that the Portland region sees snow. But yesterday, like a handful of other odd places, including Texas, America’s bike capital got walloped (by northwest standards anyway). 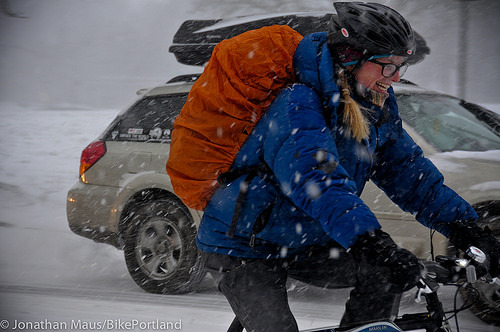 As it happens, a little snow can’t change Portland, reports Jonathan Maus at Bike Portland, who captured a series of photos showing cyclists who weren’t easily discouraged. 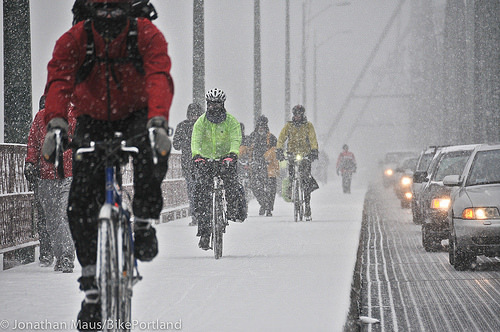 What happens to all of Portland’s bike riders when the worst snow storm in years hits the area? I was curious too so I spent a few hours out there with my camera tonight. Turns out many people took the riding as a personal challenge. Bundled up like they were climbing a mountain, most the riders I saw pedaled through the storm with equal parts concentration, determination, and smiles. I did see quite a few people that had thrown in the towel and decided to walk their bikes as the snow continued to fall. And I couldn’t blame them. The conditions were some of the toughest I’ve experienced in my 10 years as a Portland resident. As the evening commute picked up steam, so did the snow. And the wind howled too, driving the flakes horizontal and making it difficult to see and keep the bike upright. Elsewhere on the Network today: Streets.mn takes a critical look at the media coverage of the death of a “safe cyclist” in Minneapolis. Boston Streets catalogs car companies’ overtures to young people, who are increasingly weary of driving. And Urbanophile reports that the city of Long Grove, Illinois, is privatizing streets in suburban subdivisions and turning them over to property owners. Of course, the only story about Portland on NPR was David Brancaccio (or Kai Risdale) remarking that the Worst Day of the Year Bike Ride in Portland was cancelled. Why are they riding on the sidewalk? It’s more like a shared-use path, and there’s actually a stripe down the middle to seperate bikes and pedestrians, of course you can’t see it because of the snow! Please remember that this report showed a bridge from a fancy neighborhood into downtown Portland. denizens of the new gentrified areas and downtown (where all tax dollars are spent) did ride. But in my neighborhood, I only saw few brave souls, half of them committed cyclists, half transients. were given more attention than working class families. The rest of us stood at bus stops with inadequate service. Reality check. That’s not a sidewalk. And it’s downtown so it wouldn’t be legal in Portland anyway, bikes are banned on the sidewalks in the city center area (and above walking speed on the sidewalk in all other areas statewide). It’s a divided cycleway with a street going up the middle. Did they finally restripe the lanes? Illegal downtown, yes. But very necessary in Outer SE. I dismount for pedestrians, or pass by at a super slow respectful speed/distance. How else would you survive Foster Road? In the picture the bikes are being used lawfully. Its only illegal to go over walking speed when crossing driveways and intersections (other than Downtown where techincally it is illegal everywhere, but I’ve yet to ever see it enforced), On the rest of the citys sidewalks you can go as fast as you want, untill you’re in a position that you’re about to cross auto traffic. The sidewalk rules here in Portland don’t have anything to do with pedistrian safety, but everything to do with slowing down where you – as a cyclists might jump out unexpectantly in front of a car entering or crossing a private (driveway) or pubic intersection. Take the lane. You’re less visible to other road users on the sidewalk. NTSB has the odds nationwide on you being 5 times more likely to be in a collision with a car on a sidewalk, and 3 times more likely to die in a collision on the sidewalk. It’s just a bad idea all around. If you’re not comfortable with Foster Road, maybe you shouldn’t take it. It’s not like the eastside isn’t on a grid. Springwater Corridor is a good alternative from Lents to Powell Butte. There’s also “take Powell or the Gladstone-Center bike boulevard instead” since both of those are bicycle facilities (depending on if you’re going east or west). It’s a difference without distinction given how frequent intersections and driveways happen in Portland’s cramped quarters (ie, they’re often enough you either need to ride in the street or wear out your brakes prematurely to get anywhere faster than walking). I decline your kind invitation to tell me how to ride. In fact, I find your remark presumptious. I believe that Google is acting in a selfish way that will harm the arts community of SFO irreparably. Keep up the fight! Shall I send you some snow balls to throw? I agree, as long as you have wrapped yourself which you can afford so much coldness. Don’t come crying to common sense when you become a hood ornament, then. Don’t cry when some woman dresses you down for your sexism. I doubt you know Portland well. I lived in Portland for the first 27 years of my life. Odds are I know it better than someone who has the attitude of a western California transplant. The “western California transplant” remark is a non sequitur. But thanks for playing. Seems like a pretty apt description. If that’s not how you want the world to view you, don’t make the shoe fit. What is an apt description of what? Your last comment did not track very well. Thanks for the confusing mixed metaphor in the second sentence. Why am I supposed to wear ill-fitting shoes? Over and out- I have grown bored with your nonsense. “I Can’t Be Quiet About This.” How a Grieving Mother Found Her Voice. Since losing her son Dustin to a drunk driver, Kristi Finney has become one of the Portland region's most energetic and compelling advocates for traffic safety reforms.